Use the Boolean Anatomy Search application to perform complex queries for level of gene expression based on anatomical regions. Go to the Boolean Anatomy Search page. On the left is a tree view of anatomy terms that conform to the GUDMAP Ontology. 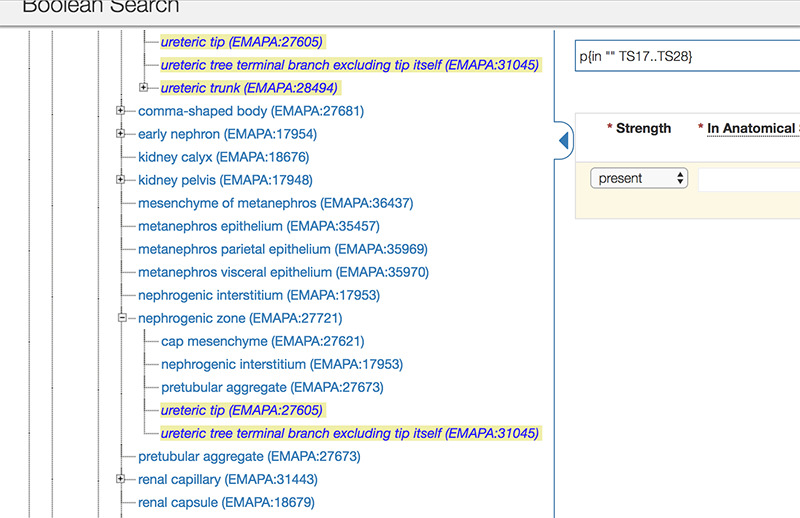 Start typing an anatomical term - terms matching your entry will be highlighted on the tree. There is also a Stage dropdown that allows you to specify a Theiler Stage for the tree. The default is TS23 (15dpc). At the top of the query pane is a text field that displays the query as you are building it. You may also construct your own text version of the query and enter it into this field instead of using the queries below (see Boolean Anatomy Search Syntax - TBD). To the right is an area where you can build a query against GUDMAP Specimen data. 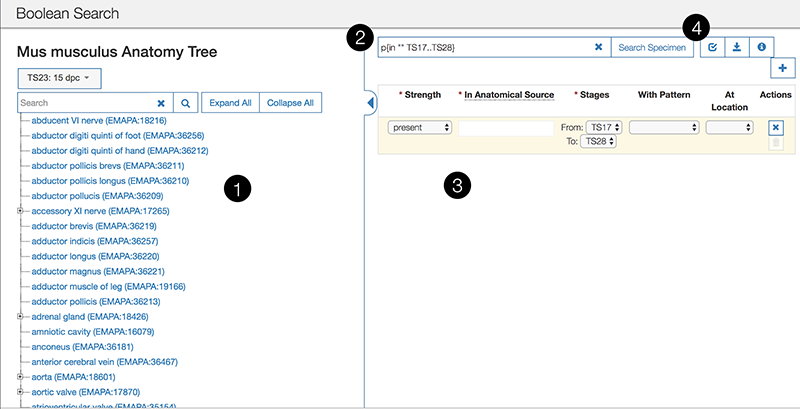 To add a query, click an anatomical term from the tree. This will populate the In Anatomical Source field. Strength: Choose from Not detected, Present, or Uncertain. Stages: You can indicate a range of developmental stages (using Theiler Stages). With pattern: Choose from graded, homogenous, regional, restricted, single cell, spotted, ubiquitous. Actions: For each row you can click the “x” button to clear the filter and start over or the trashcan icon to delete the filter altogether. Click the plus (+) button to add more queries as desired. Once you have built your queries, click “Search Specimen” to find all GUDMAP specimen data that conforms to the search. Checkbox: Use this to validate your filters. This is helpful if you are creating your own query from scratch. Download: Once you have built a query that you are likely to use again, click this button to save your query as a text file and download locally. …the screen scrolls to the matching areas of the tree. Click the branch “ureteric tip”. By default, it will show up in the initial filter with Strength shown as present. In the tree on the left, you’ll see entries for tissues surrounding ureteric tip. For each, click a term, change Strength field to not detected and then click the plus the sign until you have added them all as filters. 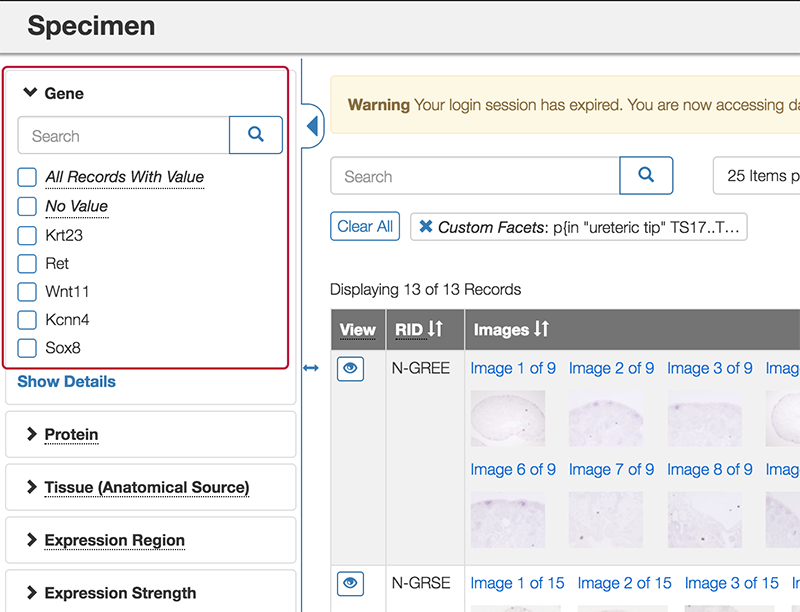 Once you have built your query, click Search Specimen to find Specimen data related to your search by gene. 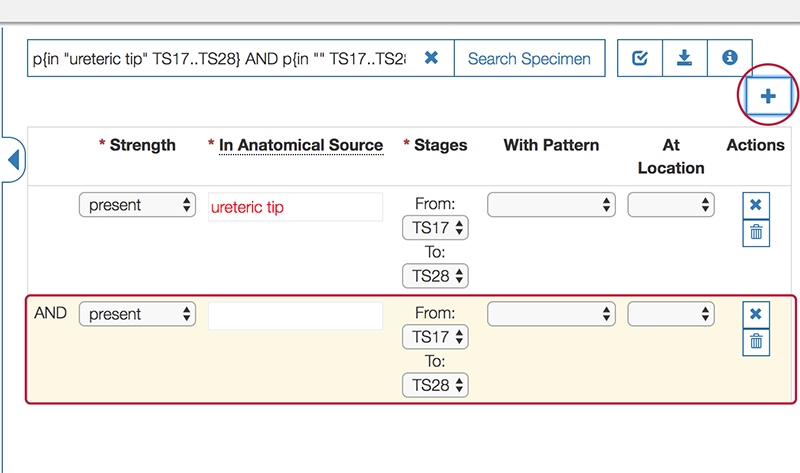 And in the filtering sidebar to the left under Gene, you’ll see the resulting genes that are expressed in the ureteric tip, but NOT in the surrounding tissue are: Krt23, Ret, Wnt11, Kcnn4, and Sox8.